In Los Angeles, Jennifer Narody has been having a series of disturbing dreams involving eerie images of a lady dressed in blue. What she doesn't know is that this same spirit appeared to leaders of the Jumano Native American tribe in New Mexico 362 years earlier, and was linked to a Spanish nun capable of powers of 'bilocation,' or the ability to be in two places simultaneously. 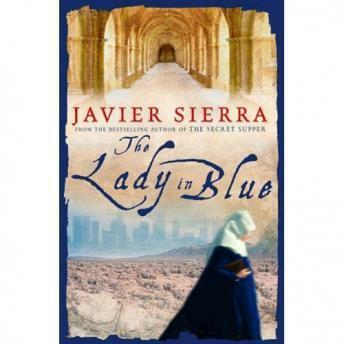 Meanwhile, young journalist Carlos Albert is driven by a blinding snowstorm to the little Spanish town of Ágreda, where he stumbles upon a nearly forgotten seventeenth-century convent founded by this same legendary woman. Intrigued by her rumored powers, he delves into finding out more. These threads, linked by an apparent suicide, eventually lead Carlos to Cardinal Baldi, to an American spy, and ultimately to Los Angeles, where Jennifer Narody unwittingly holds the key to the mystery that the Catholic Church, the U.S. Defense Department, and the journalist are each determined to decipher -- the Lady in Blue.